Cuban bandleader, singer, organist, pianist and composer (born December 11, 1916 in Matanzas, Cuba - died September 14, 1989 in Mexico City, Mexico). He is often referred to as the 'King of the Mambo'. He was born in Matanzas, Cuba, where he studied classical piano in his early childhood, and later played organ and piano in local clubs. For a time, he was pianist and arranger for La Sonora Matancera, Cuba's best-known musical group. He also worked with casino orchestras in Havana for most of the 1940s, gaining the nick-name "El Cara de Foca" ("Seal Face"). In 1948 he moved to Mexico to form his own band and record for RCA Victor. He quickly specialized in mambos, an upbeat adaptation of the Cuban danzón. In 1950 arranger Sonny Burke heard "Que rico el mambo" while on vacation in Mexico and recorded it back in the United States as "Mambo Jambo". The single was a hit, which caused Prado to launch a US tour. His appearances in 1951 were sell-outs and he began recording US releases for RCA Victor. Prado is the composer of such famous pieces as "Mambo No. 5" and "Mambo No. 8." 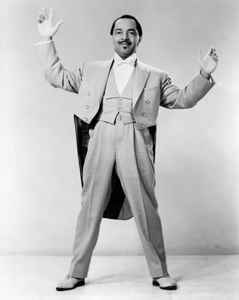 At the height of the mambo movement, in 1955, Prado hit the American charts at number one with a cha-cha version of "Cherry Pink and Apple Blossom White"
His appearances in 1951 were sell-outs and he began recording US releases for RCA Victor.